I never thought in a million years that I would compete in a fitness competition. I've always worked out, but it was mainly just cardio. When my husband, Josh, deployed earlier this year we made a bet, since we are very competitive with each other. We decided that we would both take before pictures and when he returned in 4 months we would take after pictures and have our neighbor judge the results. So, that is when I was introduced to JJ and got my first taste of J's Fit Factory. JJ is an incredible coach. He pushes you to your limits, but motivates you along the way and wants each of his clients to succeed. There were many times I questioned why I was doing this and if I was going to be ready, but JJ would always get me pumped up at my posing sessions and training sessions. He has a strong heart and puts his all in everything he does. I was nervous for my first show, but he made sure I was ready. I competed in October at the Mid-Atlantic Classic which was 12 weeks from the day I started training with JJ. I placed 2nd in the junior figure division and loved every minute of it. I'm in the best shape of my life thanks to JJ and the Fit Factory crew. When you join J's Fit Factory and begin working out there, whether you are competing in shows or attending classes, you become part of the family. Everyone that is part of the Fit Factory looks out for each other and goes above and beyond to help if needed. I cannot express how thankful I am to have such a wonderful coach who guides me along the way and motivates me to be my best. FIT HAPPENS!!! I began serious bodybuilding in August 2012. Before prepping for my first show I weighed in at 140 pounds with 24% body fat. I knew nothing about proper diet nor did I know how to lift correctly. After a long 12 weeks, 30 pounds down and dropping 18% body fat i was ready to step on stage as a light-weight bodybuilder weighing in at 110 pounds. It was an awesome experience. I loved it so much i wanted to see how far i could take it. After my first show i knew i would need help getting to the level I wanted to achieve. I began training with JJ Henry in Jan 2013. JJ has helped me, pushed me, mentored me, and kept me going even on my worst days. A year and half later and an additional 12 pounds of muscle, I have JJ Henry to thank. Deciding to compete is what got me started on my journey, but the people along the way is what kept me on the right path. I used to be overweight. Not just overweight, but borderline obese. My highest weight was 240 lbs. I would yo-yo with my weight as a kid. I would get chunky and then I'd hit a growth spurt and thin out. But when I stopped growing, the real weight started to pack on. I was only 20 years old, and I just didn't really put much thought into nutrition. I ate fast food almost every day. I was not happy. I hated myself. I started out at home doing Tae Bo videos and Atkins. I lost 35 lbs! Then, I gained 45. I said enough is enough. I'm doing this again! I lost 45 lbs! Then I gained 75 lbs. This was my highest weight. The 240 lb mark. Boy was this a dark place for me. After a few tries at this, I figured it out. I can't go back to my old ways. I have got to stick with it and make it a lifestyle. So back onto Atkins I went. Tae Bo and The Firm videos back in the VCR. I lost 35 lbs. I joined the YMCA in Hope Mills to add some variety. I did mostly step classes, and I lost 10 pounds. Then, I stalled. After a lot of research I incorporated resistance training into my workouts, and BAM! I got knocked out of that plateau and continued to lose body fat and gain muscle. Pretty soon, I was down 75 lbs. My lowest weight was 155, but my comfortable weight was 165. I was way too skinny at 155. Soon after, I followed Inge over to Gold's since she started teaching classes there. I was then asked if I wanted to go to BodyPump training and become an instructor. I had never heard of BodyPump before, but I jumped on the opportunity! I also met JJ at Gold's then. He was the manager. I found my passion that year - 12 years ago. A few years later, I went to BodyAttack training, and a few years after that, I went to BodyStep training. The journey continues. I always wanted to do a figure competition after attending one of JJ's shows back in 2002. I finally committed to it in December 2013. I had to get my mind right. It was time. At that point, I put on about 20 lbs. I was 185 in these pictures and 28% bodyfat in December 2013. JJ taught me how to feed my body properly. He taught me that training is different from working out. I got down to 155 and 8% bodyfat for my first show in April 2014. I took home first place in that show, and first place in my second show. I cannot thank JJ and the Fit Factory crew enough. They have completely changed my life! When I turned 40 I started working out regularly and have been doing so for about six years. I had always toyed with the idea of competing as an amateur bodybuilder and although I felt that I was in good shape, I did not feel that I had what it took to get on stage and be judged against other guys, many of them much younger. Once I decided to give it a shot, I started preparing but still felt that I was missing something. I became quite concerned that I would be "that guy" on stage. The guy that everyone looks at as being clearly out of his league. I sought JJ out and gave him one set of instructions........Don't let me embarrass myself. JJ went right to work. He took control of my diet, weights and cardio. He helped me put together a routine that excited the crowd. I shredded 20+ pounds in 8 weeks while gaining definition. 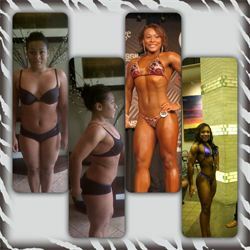 I placed 2nd in my first competition followed by two 1st place finishes 10 weeks later. He was supportive all the way up to and including the day of both shows. I do not know how many more competitions I will do, but I do know that JJ will be my prep trainer for each and every one of them. Starting out at 145lbs, I wasn't in the best shape and I knew I was not happy with my life and I had no drive or motivation for much of anything. I started working out with JJ to compete in a Figure competition in April 2012. He saw the best in me and has brought me to the confident athlete, and woman, I am today. I am so grateful to have a coach that has a vision for me and motivates me in all areas of my life. His energy is so contagious...it is what gets me through some of my workouts on my show prep diet. He has the most positive outlook on life! JJ is truly the best at what he does and I am proud to be a part of his team.